Raina Marie Pitts joined Methfessel & Werbel in September 2009 after completing a judicial clerkship for the Hon. Frederick J. Schuck, J.S.C. in Camden County, New Jersey. During her clerkship, Mrs. Pitts was responsible for the management of the Judge’s motion calendar, drafting legal memoranda and assisting the Judge with cases involving verbal threshold issues, professional malpractice, insurance liability, breach of contract claims and various other civil matters. Additionally, Mrs. Pitts was certified by the State of New Jersey as a civil mediator and assisted parties in the settlement of landlord/tenant, special civil and small claims matters on behalf of the Court. While in law school, Mrs. Pitts served as a student attorney with Howard Law’s Alternative Dispute Resolution Clinic and completed a legal clerkship with the Equal Employment Opportunity Commission for the District of Columbia. Mrs. Pitts also served as a legal assistant with the Washington D.C. Sports and Entertainment Commission, summer associate with the National Basketball Player’s Association and law clerk with the Office of the Prosecutor, Camden County. Mrs. Pitts graduated from Howard University School of Law a Merit Scholar and was awarded the Washington Bar Association Scholar Award for demonstrating exceptional academic achievement and community involvement. 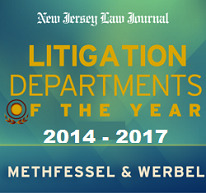 Mrs. Pitts is a member of Methfessel & Werbel’s Employment Practices group under the direction of Eric L. Harrison. Her practice is concentrated in the areas of employment law, education law, public entity law, discrimination and civil rights.